Indigenous Naturopath Doctors Amsu Anpu, IND and Amun Neb, IND release Got Fibroids? The Fibroid Elimination Bible, endorsed by Dr. Ali Muhammad, IND and celebrity chef, Chef Ahki, guiding readers on how to get rid of their uterine fibroids naturally, without surgery, in particular, hysterectomies (the removal of the entire uterus/womb) and myomectomies (the removal of just the fibroids), or uterine artery embolization (UAE), which is a procedure which cuts off the blood supply to the uterine artery, thus shrinking the fibroids. This easy to follow procedural manual, promises the reader to achieve extraordinary health through the dietary abolition of the substances responsible for causing uterine fibroids and other major reproductive disorders. Atlanta, GA – According to the Centers for Disease Control (CDC), 80% of all women will suffer from uterine fibroids; African-American women, and women who are overweight, are the highest risk factor – African American women being 3 – 5 times more likely to develop fibroids than women of any other race; and the cause for uterine fibroids remains unknown. The CDC statistics for hysterectomies are equally astounding: The United States performs more hysterectomies than any other country in the world. There are over 600,000 hysterectomies performed in the United States each year, over 300,000 of which are due to uterine fibroids. An overwhelming 78% of all the U.S. hysterectomies are performed on African-American women, which means that there are 468,000 African-American hysterectomies per year, and that over 234,000 of them are due to uterine fibroids. Such rates, being the highest in the industrialized world, has led to the major controversy that hysterectomies are being largely performed for unwarranted and unnecessary reasons. The mainstream medical establishment’s response to the fight against fibroids remains somewhat archaic, but its insufficiency in providing better remedy appears to support commercial interests whilst ignoring our demand for more effective treatment. According to a study performed by Obstetrics & Gynecology, over $5Billion is spent each year on just the hysterectomy procedure. An additional $5Billion is spent on post-hysterectomy treatment and medication, such as hormone therapy. Doctors “Amsu” and “Amun’s” book, Got Fibroids? 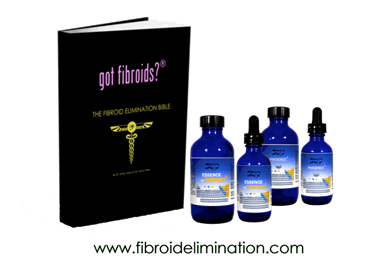 The Fibroid Elimination Bible, teaches and proves exactly what is responsible for uterine fibroids, despite the continued denial of the so-called authorities, and provides a step by step procedure in eradicating this tumorous epidemic, with a strict regimen of diet, powerful proprietary herbal supplements, and exercises within each phase. The female reproductive system is extremely sensitive, and must remain in hormonal balance at all times to achieve and sustain optimal health. We therefore need a fresh perspective that goes beyond the covertly motivated un-explanations and options that have been afforded thus far. Women who choose to forego hysterectomy and undergo the other alternatives. i.e., myomectomy or UAE, are seldom made aware of the risks, such as abdominal adhesions, uterine cancer, and even death by embolism, associated with these procedures, nor are they told that the procedures are often not totally successful, and that fibroids will return without a change in lifestyle. The best “quick fix” for uterine fibroids, Dr. Amsu explains, is not a quick fix at all; rather, it is a change in lifestyle that is to last the rest of a sufferers lifetime. The Fibroid Elimination Bible (or as Dr. Amun likes to call it: “FEB”) is a methodical, step-by-step process of answering everyday questions that lead to awareness that turns into action that results in symptom relief that, ultimately, is the byproduct of total uterine fibroid elimination and a new life of boundless energy and vigor. Dr. Amsu and Dr. Amun are visionary practitioners, with decades of experience combining a scientist’s perspective with common sense and wisdom. Got Fibroids? The Fibroid Elimination Bible, represents a superbly insightful and refreshing advancement in the literature of Female Reproductive Health. It is important, fun to read, and potentially life changing. Dr. Amsu and Dr. Amun are the founding members of the AMA Health division of the Aboriginal Medical Association, which is an institution dedicated to the advancement of natural herbal remedies that cater specifically to the biology of the world’s Indigenous peoples. The doctors offer a no-nonsense and often witty point of view on today’s healthcare needs and challenges, and they provide, in their book, a tried-and-true solution for healing uterine fibroids, ovarian cysts, yeast infections and other female reproductive diseases and disorders. They also provide a social media support community, 60 Day Fibroid Elimination Challenge Group, for fibroid sufferers, on Facebook.